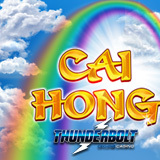 Realtime Gaming’s new Cai Hong is coming to South Africa's Thunderbolt Casino tomorrow. The luxurious Cai Hong slot celebrates wealth and prosperity. Until April 21st, Thunderbolt will give you 30 free spins on the exciting new game, a sequel to the God of Wealth Chinese slot game released two years ago. Caishen is the Chinese God of Wealth. In the new Cai Hong slot he’s the Wild symbol. Wilds double prizes they’re part of. Three or more Rainbow Scatter symbols trigger 8 free games with all wins doubled. During free games, Scatters trigger Bonus Picks. Players choose gold coins to reveal prizes – up to 33 free spins with up to 15X multiplier. Cai Hong is the fourth new Chinese-themed game to come to Thunderbolt this year. Celebrating the Year of the Dog, Fu Chi’s Wild symbol is a Lucky Dog that doubles any win it’s part of. Inspired by Chinese film legend Jackie Chan, the Fantasy Mission Force slot game has a couple of explosive bonus features to maximize players’ wins. Jackie Chan is back in Eagle Shadow Fist. Shanghai Lights’ Wild symbol only appears on the middle reel, but when it does it expands to cover the entire reel. Thunderbolt Casino, where all games are played in Rands, is one of the most popular online casinos in South Africa. It offers a huge selection of real money online slots and table games from Realtime Gaming.